Nites Out magazine volume 3 features freights, walls, bombing and girls. 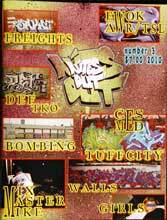 The featured writers for this issue are CES One, MED, Ewok of AWR/TSL and Def of TKO. This edition also contains a feature on Mixmaster Mike.